The number of Russian Dragoon regiments fluctuated quite dramatically over the course of the Napoleonic Wars. In 1801, Viskovatov lists 15 regiments of 5 squadrons each (Pskov, St Petersburg, Smolensk, Orenburg, Moscow, Ingermanland, Sversk, Kargopol, Kinburn, Vladimir, Taganrog Narva, Nizhnii-Novogorod, Irkutsk, and Siberia - like all Russian names, there are several variants of these in different translations!). However, both Nafziger [The Russian Army, 1800-1815, RAFM Co, Inc, 1983] and Haythornthwaite [The Russian Army of the Napoleonic Wars 1799-1814: Osprey Publishing, 1987] state that there were initially but 11 regiments of Dragoons, each of four squadrons, without naming them. All three sources agree that seven Cuirassier regiments were converted to Dragoons in July 1801 (Kazan, Kiev, Riga, Starodoub, Tver. Karkov, and Tchernigov). These 18 (or 22?) regiments were joined by five more newly raised regiments (Borisoglievsk, Kourland, New Russia, Pereiaslav, and White Russia in May 1803. In 1804, according to Nafziger and Haythornthwaite, a 5th squadron was added to all of the Dragoon (and Cuirassier) regiments (Viskovatov has them already at 5 squadrons, but states a "replacement half squadron" was added). Two new regiments (Jitomir and Livonia) were added in 1805, and June in 1806, two more (Finland and Mitau) folllowed by still another six regiments in July 1806 (Arsamass, Tiraspol, Iamburg, Niejine, Dorpat, and Serpuchov), bringing the total to 33 (or 37!). Another regiment, the Korel Dragoons were supposedly raised in 1809 (Nafziger and Haythonthwaite) and disbanded in 1810 without ever seeing combat; Viskovatov doesn't mention it. The Pskov and Starodoub regiments became Cuirassiers. The badly damaged Irkutsk regiment was joined to the Count of Saltikoff's (volunteer) Hussars to become the Irskutsk Hussars. The Iamburg, Orenburg, Siberia, Jitomir, Vladimir, Taganrog, and Sepuchov regimernmts were converted to Uhlans. The Niejine, Arsamass, Dorpat, Livonia, Pereiaslav, Sversk, Tchernigov, and Tiraspol regiments were converted to Mounted Jagers (aka Chasseurs a Cheval). The uniforms of the Russian Dragoons similarly evolved over time. In 1800, the double breasted coat was very similar to that of the infantry, medium green in color, with red turnbacks and collars and cuffs and shoulder straps in the regimental facing color. Initially a black bicorne hat was worn, but in 1803 the helmet with a black "sausage roll" crest was adopted. Crests were red for trumpeters, while officers crests were white with a black tip, separated by a thin orange band. NCO's had black crests with a white tip, which was divided in half by a vertical orange line, and gallons on the collars and/or cuffs in the button color. Generals had all white crests when wearing the uniform of their regiment. Buttons were white or yellow metal depending upon the regiment (see table below). Pants were white in full dress, buff or grey for field wear. The shabraques were grey. In late 1807 the color of the coats and shabraques became dark green, the later bordered in the regimental color, and in 1808 the helmet crest changed to upright black horsehair for privates, NCO's and officers (no more tricolor crests, except that the officers retained the old sausage roll ones for parade wear until 1811). Officers were allowed to wear dark green pants in non dress uniform, and in 1814 a double stripe in the regimental color was added to the outside seam of the grey riding pants. * Writing in Green indicates this regiment’s collar has dark green piping. This is the Moscow Dragoon Regiment; I have depicted them with the 1814 stripe on the grey service trouser, becauses, well it looks good! Note the red crest on the trumpeter, as well as lace (in the button color) decorating the shoulder wings and sleeves. I rather like the pink facings of the Moscow regiment - and they have a much better combat record than Barry's fancy new Front Rank dragoon regiments, whose watchwords are "Run Away!" Indeed, Czar Barry has actually threatened them with being dismounted to fight on foot (courtesy of some fine Steve Barber models seen in the second link). Like all the units shown in this particular post, my units are tried and true old Minifigs painted 20+ years ago. Final view of the Moscow Dragoons; they are still carrying their old model 1797 standards, simply because I like them better than the later 1803 model ones, and the Russians were known to retain old models of flags long after they were theoretically superseded by new models. The grey portmanteau/valise is correct. These fine fellows are the Pereiaslav Dragoons, with their sophisticated violet facings. See Barry, by having my Dragoons be units with violet and pink facings, they *have* to fight well to avoid being harassed by their Russian infantry comrades, LOL!. A blurry picture, but once again the trumpeter has a red crest on his helmet. The flag is of the proper post 1803 model for this unit; being raised in 1803, it was never issued with a flag of the 1797 model. ﻿Rear view of the Pereiaslav Dragoons; once again they have the facing colored stripe on their grey trousers; as this unit was converted to mounted Jagers in 1813, it predates the regulation authorizing this bit of ornamentation. Clearly a bunch of radicals, LOL! The Russian Army had previously had a number of regiments of Chasseurs a Cheval (Mounted Jagers), but they had been disbanded by Czar Paul. As noted above, they reappeared in the Army the very end of 1812, when eight units of Dragoons were converted to Mounted Jagers. The Mounted Jagers were dressed in quite modern uniforms, consisting of a dark green jacket and pants, initially double breasted, with dark green collars and turn backs piped in the facing color, which also appeared on the pointed cuffs, shoulder straps, and a wide double stripe of piping down the outside seam of the pants. All regiments had white buttons. In 1814, the jackets changed to single breasted (with a stripe of piping in the facing color down the front of the jacket). Also in 1814, grey trousers with facing colored stripes were authorized for field wear. Most but not all regiments kept the same facing color that they had had earlier as Dragoons. This regiment is the Arsamass mounted Jagers. The tall white plumes have an orange and white base. Trumpeters as usual have red plumes, and NCO and officer plume colors are "as in the grenadiers", the orange tip seen here on the standard bearer denoting an NCO*, who would also have the usual "gallon" lace (white) on the collars and cuffs. The cords on the "kiver" "coal-scuttle" shako were green. I've painted the trumpeter with red cords, but that probably is incorrect, most likely they were green as well as nothing different is specified for their cords in Viskovatov. Trumpeters also had white lace chevrons on their sleeves; the silver color of the trumpet is correct also, as are the grey portmanteaus common to Russian cavalry of this era. The Arsamass Mounted Jager regiments showing their a... derrieres! They are also carrying the old 1797 pattern standard, which first should have been replaced by the 1803 model, and secondly, should presumably have been surrendered when they were converted from Dragoons to light cavalry. Now there's another idea for Czar Barry to try for motivating his notorious 4th Dragoon Division to a higher level of performance - threaten them with conversion to Mounted Jagers, with loss of their flags! The final unit is the Sversk Mounted Jagers; this unit has orange facings. I probably should have chosen a different shade for their horses; the reddish color I used seems to make the orange facing color almost disappear. The white plume tipped black that the standard bearer is wearing indicates that he is an officer*; as such his shako cords should be silver instead of green. Also the portmanteau should be grey instead of the almost French like dark green piped orange. Details, details! * The officer and NCO plume details for the Mounted Jagers may or may not be exactly correct; here I am mostly relying on the plates in Funken [L'Armes et les Unifomes des Soldats du Premier Empire], which is less than fully reliable for Russian uniform details. However, a Grenadier NCO would have a white tip to their black plume - and a white tip isn't something that wouldn't show every well on the white plumes of the Mounted Jagers! Officer plumes present similar problems. If anyone has better information, I'd e happy to hear of it. No this isn't the Russian winter - this is just over a week ago in our back yard - 18" of fresh snow in Connecticut on October 29th; unheard of! 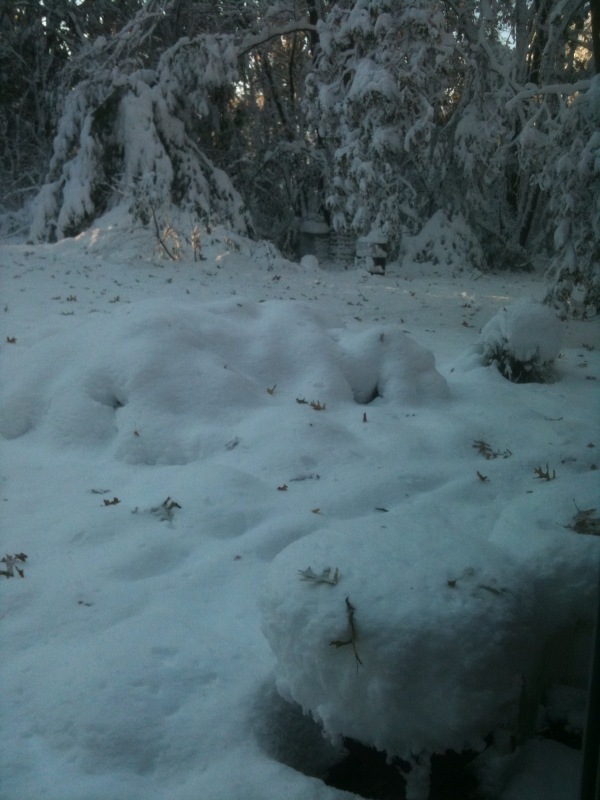 Because the trees still had many of their leaves still attached, and the snow was a very heavy wet precipitation that stuck to even oak leaves several inches thick, limbs broke all over and trees fell, leaving well over 800,000 CL&P customers without power in the aftermath. Another view of our back yard - it is 18" to the top of the barely visible bottom rung of the fence. We finally got our power back mid day on Friday 11/4 - after 6 days. There are still some without power tonight, 9 days later. Crazy! Most of us were also without power for about 5 days 2 months ago in the aftermath of Hurricane Irene; a generator has now been ordered for our house after prolonged outages twice in 2 months. So, that's what made this post later than usual; Mother Nature herself! Hmm, maybe I could have played "Retreat from Moscow" in the back yard - there's still some snow now in the shady spots! Oh well, back to painting those Russian Hussars for our Borodino game at Ellis Con in under 2 weeks! A brilliant essay ! Thorough, informative, and impeccably presented. Well done. That information is also extremely timely for me ... I haven't touched the cavalry for my Eylau Russians yet, but now I have all the data in the 1 spot. Thanks for putting the time into producing this quality post. I hope that's not your painting shack buried back there in the snow. 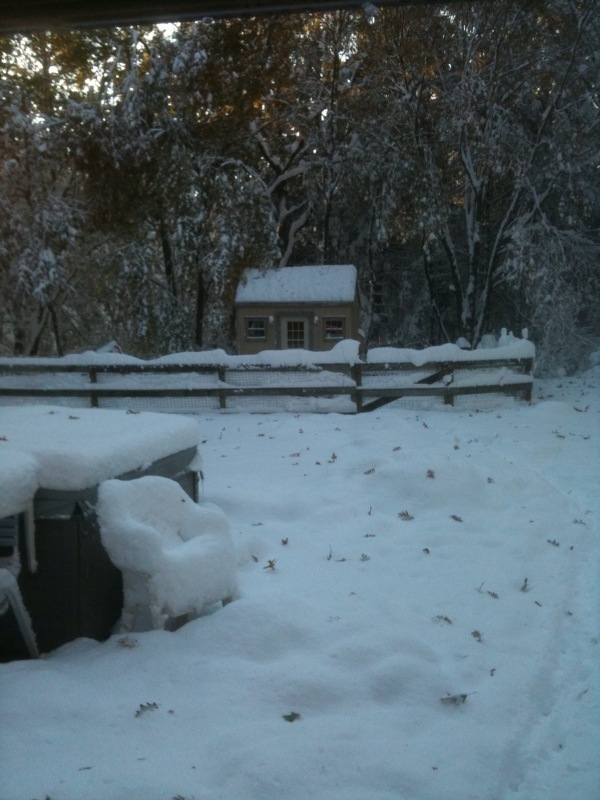 I think the snowy backyard might be the perfect terrain for a a winter Napoleonics game. You can sculpt the snow and make all the cheap valleys and hills you want. Sorry about the drought, I know that much of Australia has been having a rough time that way, while here in New England we have had record setting precipitation all year! @ Dave: The day after the storm the weather was quite cold (20's), so we could easily have had a "snow table" out there. Barry has a painting shack (unheated); beyond the fence is actually a small pool, and the shed that stores the backyard stuff, pump, filter, etc. Oh, and those vague bumps seen in the midground of the first picture - those are 5 foot high Azalea bushes! What's the structure in the background...it looks interesting. We had our first snow last night and three earthquakes since Saturday! Hey Larry, I was actually reading your house blog yesterday, in part because Steve (different Steve than above)is about to tackle converting the loft/attic in his house to a wargames room, and that reminded me of your house, of course! I was not happy to tread about the structural damage from the quake; we felt the distant effects of the quake near Washington, DC several months ago. The structure in the distance is the Pool House; really just storage, but about 7 feet tall to the bottom of the roof by 6 feet deep, by 12 feet long. Hello.This article was really fascinating, especially because I was searching for thoughts on this issue last Wednesday.